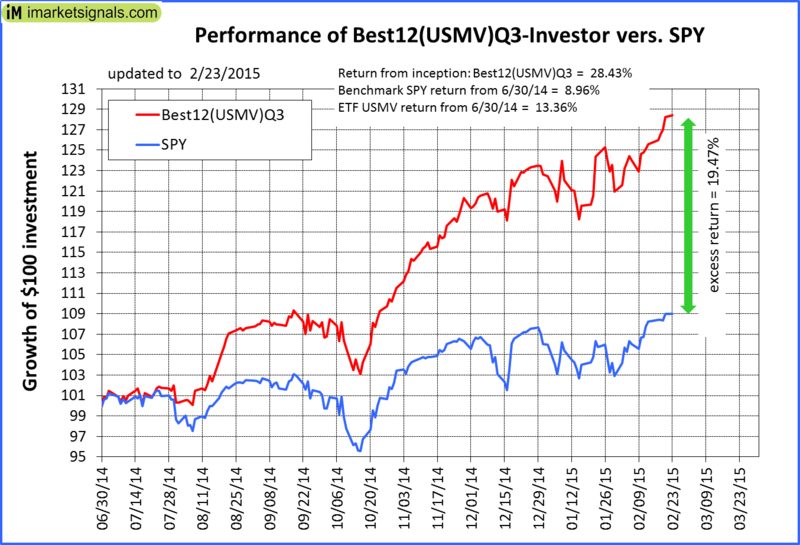 The iM-Best(SPY-SH) model currently holds SPY, so far held for a period of 63 days, and showing a 2.17% return to 2/23/2015. 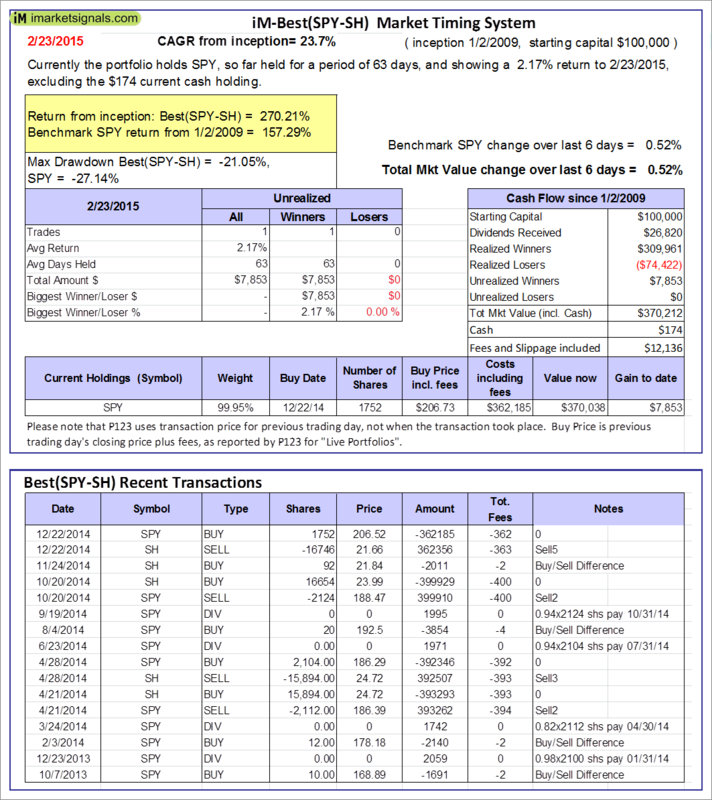 Over the previous week the market value of Best(SPY-SH) gained 0.52% at a time when SPY gained 0.52% A starting capital of $100,000 at inception on 1/2/2009 would have grown to $370,212 which includes $174 cash and excludes $12,136 spent on fees and slippage. The iM-Combo3 portfolio currently holds SPY, XLV, and SSO so far held for an average period of 161 days, and showing a 12.90% return to 2/23/2015. 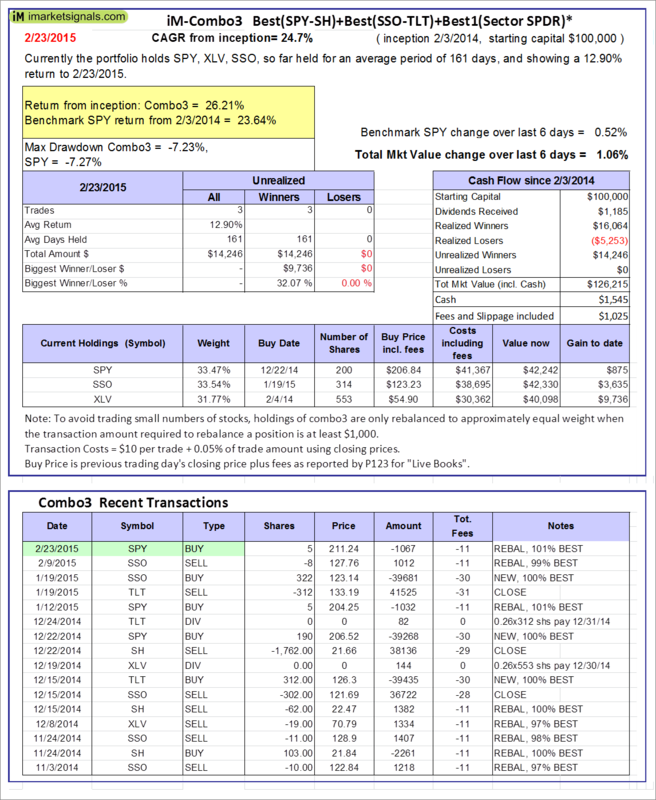 Over the previous week the market value of iM-Combo3 gained 1.06% at a time when SPY gained 0.52% A starting capital of $100,000 at inception on 2/3/2014 would have grown to $126,215 which includes $1.545 in cash and excludes $1025 in fees and slippage. The iM-Best(Short) portfolio currently has 2 short positions. 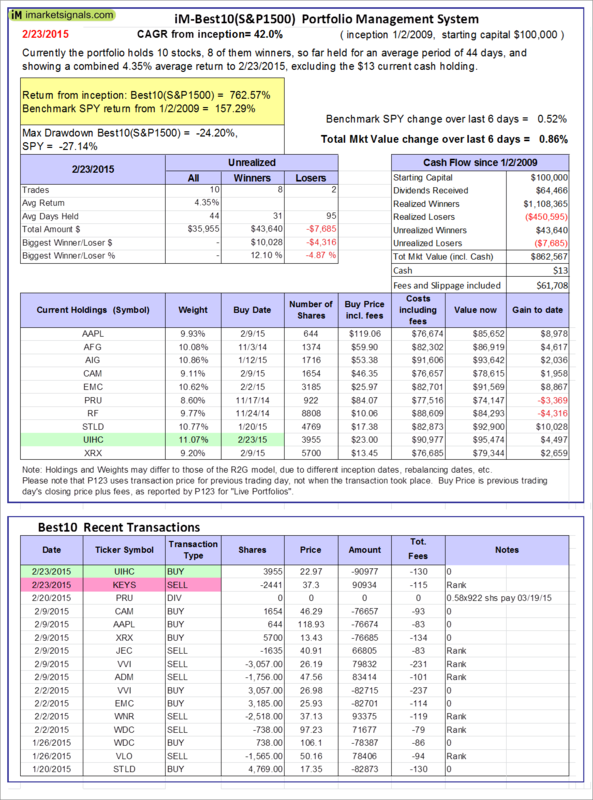 Over the previous week the market value of Best(Short) gained -0.51% at a time when SPY gained 0.52% Over the period 1/2/2009 to 2/23/2015 the starting capital of $100,000 would have grown to $104,384 which is net of $17,202 fees and slippage. iM-Best10(S&P 1500) portfolio currently holds 10 stocks, 8 of them winners, so far held for an average period of 44 days, and showing combined 4.35% average return to 2/23/2015. Over the previous week the market value of iM-Best10(S&P 1500) gained 0.86% at a time when SPY gained 0.52% A starting capital of $100,000 at inception of 1/2/2009 would have grown to $862,567 which includes $13 cash and excludes $61,708 spent on fees and slippage. 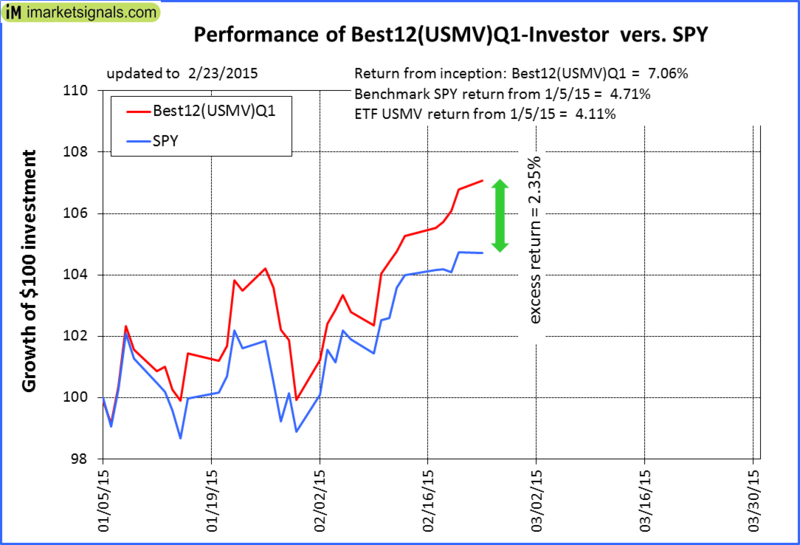 The iM-Best12(USMV)Q1-Investor currently holds 12 stocks, 10 of them winners, so far held for an average period of 44 days, and showing combined 6.58% average return to 2/23/2015. Over the previous week the market value of iM-Best12(USMV)Q1 gained 1.46% at a time when SPY gained 0.52% A starting capital of $100,000 at inception of 1/15/2015 would have grown to $107,063 which includes $221 cash and excludes $134 spent on fees and slippage. The iM-Best12(USMV)Q3-Investor Currently the portfolio holds 12 stocks, 12 of them winners, so far held for an average period of 220 days and showing combined 29.19% average return to 2/23/2015. 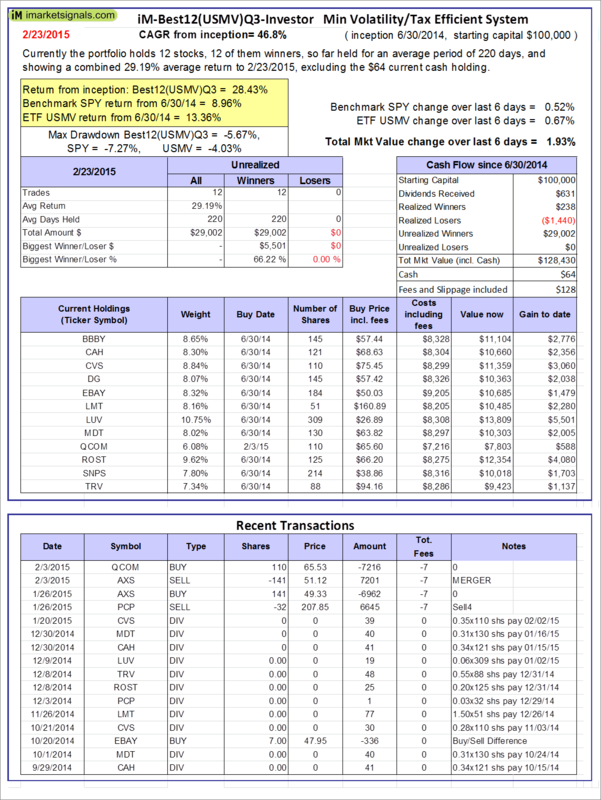 Since inception, on 6/30/2014, the model gained 28.43% while the benchmark SPY gained 8.96% and the ETF USMV gained 13.36% over the same period. 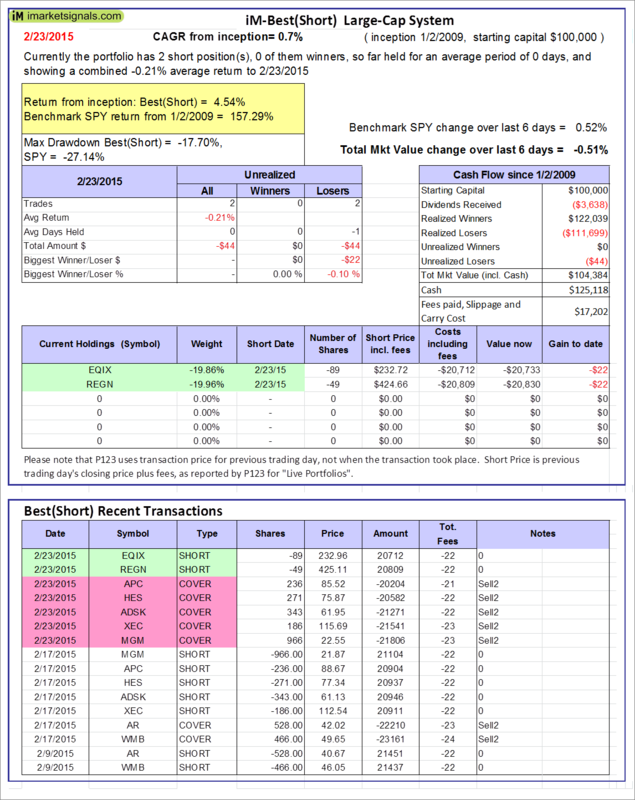 Over the previous week the market value of iM-Best12(USMV)Q3-Investor gained 1.93% at a time when SPY gained 0.52% A starting capital of $100,000 at inception on 6/30/2014 has grown to $125,430, which includes $64 cash and $128 for fees and slippage. 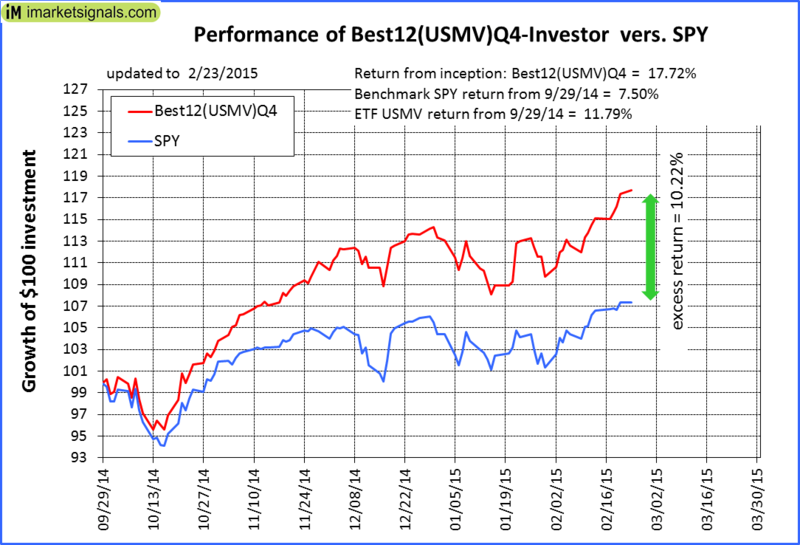 The iM-Best12(USMV)Q4-Investor Currently the portfolio holds 12 stocks, 11 of them winners, so far held for an average period of 127 days, and showing combined 18.77% average return to 2/23/2015. 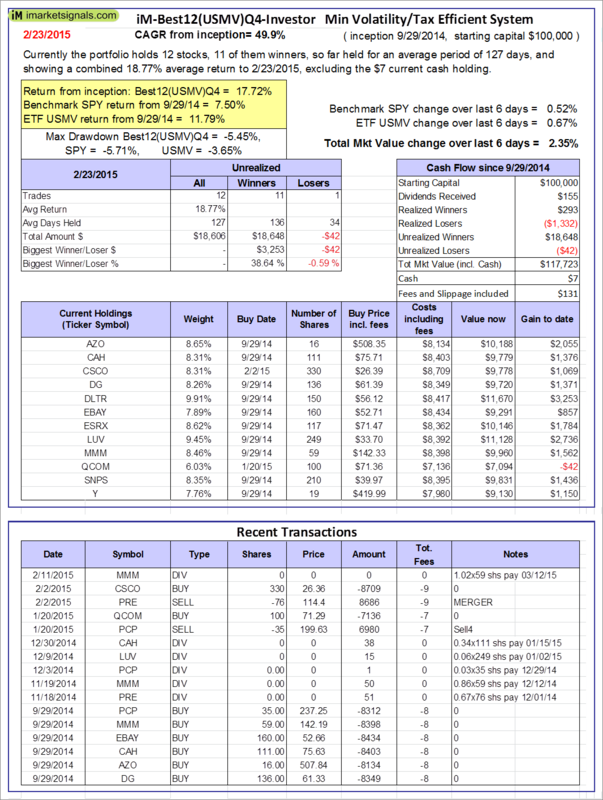 Since inception, on 9/29/2014, the model gained 17.72% while the benchmark SPY gained 7.50% and the ETF USMV gained 11.79% over the same period. 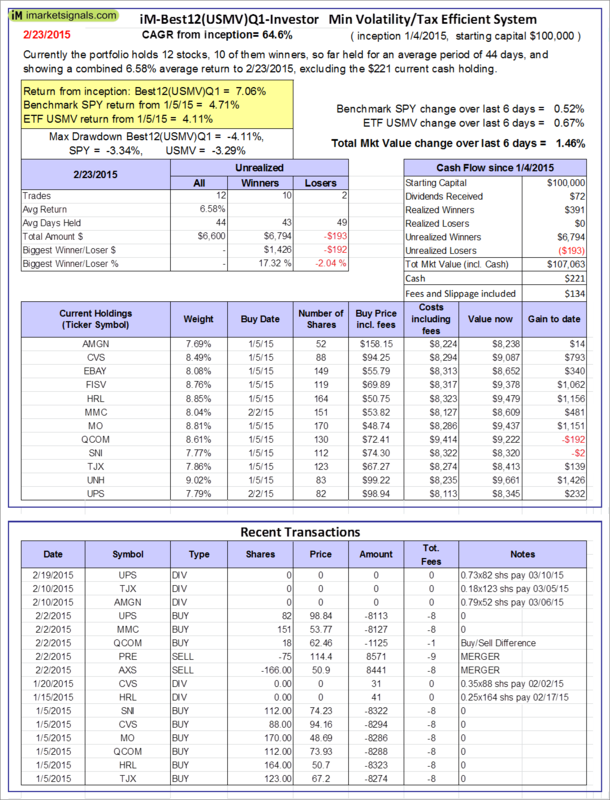 Over the previous week the market value of iM-Best12(USMV)-October gained 2.35% at a time when SPY gained 0.52% A starting capital of $100,000 at inception on 9/29/2014 has grown to $117,723 which includes $7 cash and $131 for fees and slippage. The iM-Best12(USMV)-Trader Currently the portfolio holds 12 stocks, 10 of them winners, so far held for an average period of 104 days, and showing combined 7.86% average return to 2/23/2015. 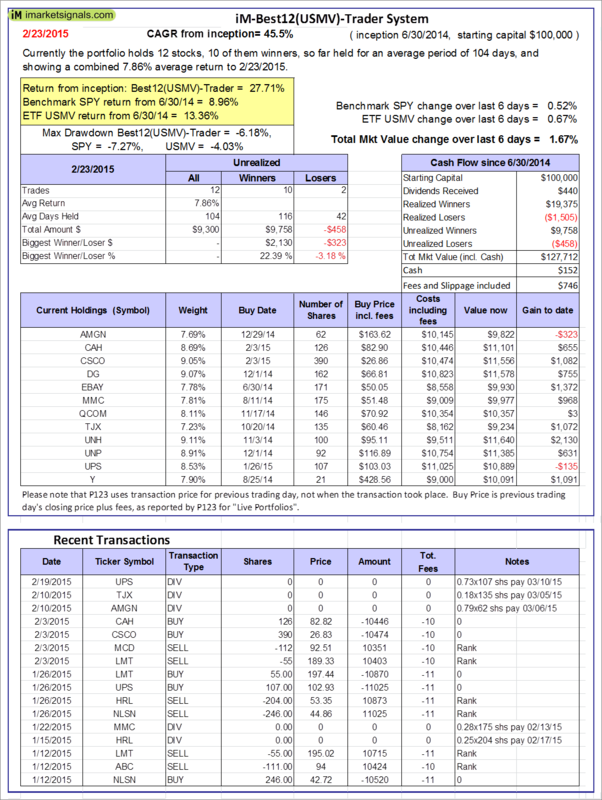 Since inception, on 6/30/2014, the model gained 27.71% while the benchmark SPY gained 8.96% and the ETF USMV gained 13.36% over the same period. 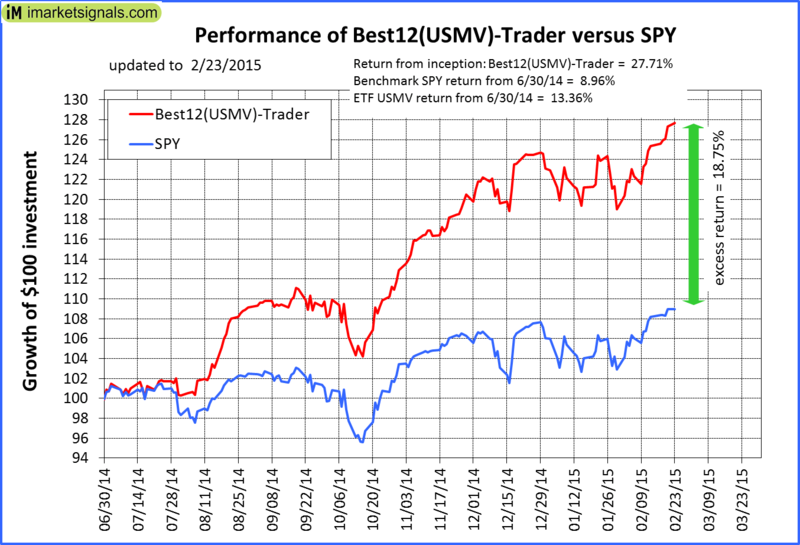 Over the previous week the market value of iM-Best12(USMV)-Trader gained 1.67% at a time when SPY gained 0.52% A starting capital of $100,000 at inception on 6/30/2014 has grown to $127,712 which includes $152 cash and $746 for fees and slippage. The iM-Best10(VDIGX)-Trader Currently the portfolio holds 10 stocks, 8 of them winners, so far held for an average period of 168 days, and showing combined 9.85% average return to 2/23/2015. 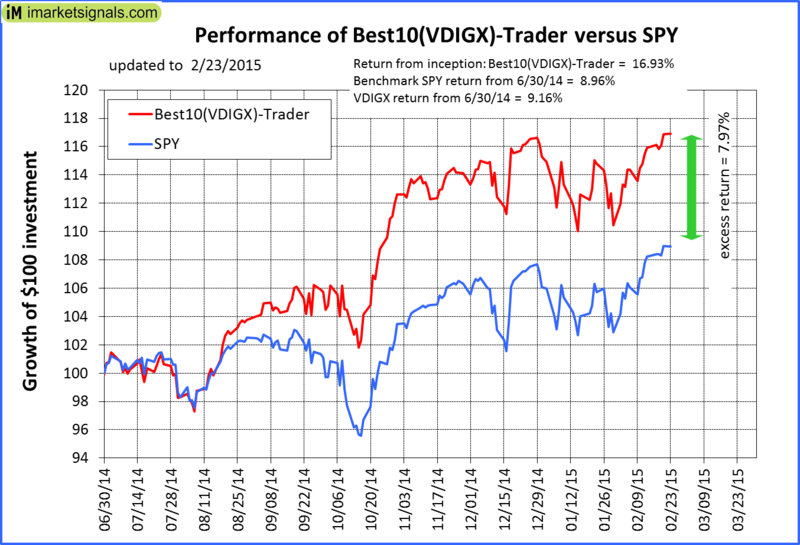 Since inception, on 6/30/2014, the model gained 16.13% while the benchmark SPY gained 8.39% and the VDIGX gained 8.70% over the same period. 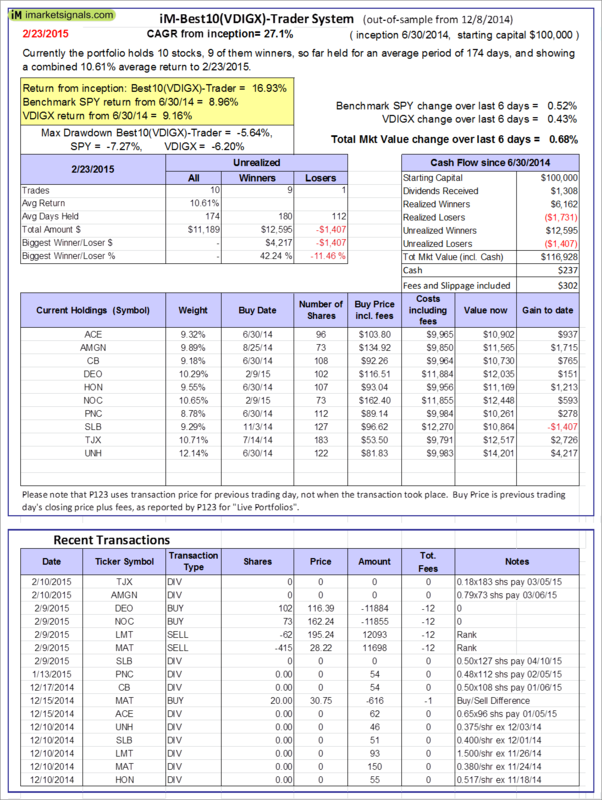 Over the previous week the market value of iM-Best10(VDIGX)-Trader gained 0.68% at a time when SPY gained 0.52% A starting capital of $100,000 at inception on 6/30/2014 has grown to $116,928 which includes $237 cash and $302 for fees and slippage.